The compact 2U chassis and energy efficient processors enable the Dell PowerEdge C2100 to help Administrators maximize space and server density while reducing cost and energy requirements. The system is highly adaptable to accommodate a variety of different workloads and can support either 24 x 2.5-inch SFF, or 12 x 3.5-inch LFF high-capacity storage devices. Intel's 5500 chipset supports either one or two Intel Xeon 5500 or 5600 processors with four to six cores per processor. With dual processors the system can host up to 18 DDR3 DIMM modules. Power is provide by high-efficiency single or dual, redundant 750W power supplies. With a single processor installed, the system will support a maximum of nine DDR3 memory modules with each processor supporting three memory channels with three memory slots each. With a two processor configuration and all 18 slots outfitted with 8GB DDR3 memory modules, the system will support up to 144GB of memory. Memory modules of different capacities can be mixed in specific configurations, and 8GB low-voltage memory modules are also supported. Hot plug SAS, SATA, and nearline SAS HDDs and SSDs are supported on the Dell C2100 server. 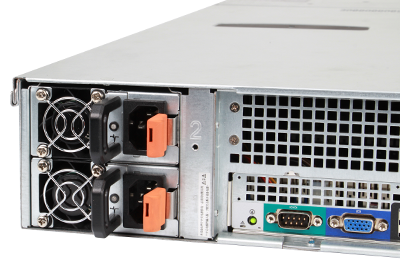 Configurations include a 24-bay 2.5-inch SFF drive chassis, and a 12-bay 3.5-inch LFF chassis. A cooling shroud inside the system directs fresh air over the CPUs and memory modules but also supports two optional SFF storage devices. Using SATA storage devices, the system will support a maximum capacity of 25TB. Or 24TB using nearline SAS drives. Flexible backplane options are available to support different workloads. There are four PCI express slots, including two x8 PCIe 2.0 slots and a dedicated PCIe slot for a 10GbE daughter card, and another to support an LSI 2008 SAS daughter card. Management is provided by the Base Management Controller (BMC) with Intelligent Platform Management Interface (IPMI) for access to the system independent of the OS. The Dell PowerEdge C2100 server offers high-density memory and storage to make short work of complex data sets and can be adapted to satisfy a variety of workloads. In general, the PowerEdge C server line is designed to be energy efficient and provide the most compute power in the least amount of space for a quicker ROI. With a purpose-built chassis, Administrators can use this platform as a building block to rapidly scale to meet increased business demands. This platform is ideal for applications in high-performance computing (HPC), Web 2.0, data analytics, and cloud.